It is unusual to require the addition of microbial populations but usual to assess the nutrient requirement and amend the basic nutrients and organic substrate of the soil if any of these elements are deficient or absent. Oxygen (via the introduction of air) is essential to allow the microbial population to develop cultures capable of sustaining degradation. Non-chlorinated hydrocarbons within the carbon chain lengths C6 to C14 are readily treatable, non-chlorinated hydrocarbons with carbon chain lengths C15-C32 are treatable but require longer time periods to degrade. Chlorinated hydrocarbons and other more complex chains can be degraded but require detailed assessment and analysis to determine suitability. As a general rule all but the most homogenious of excavated soils require processing before bioremediation techniques can be successfully applied. There are a number of different techniques and formats to biological treatment however the basic principal of intruducing the correct soil oxygen, moisture and nutrient conditions prevails. The simplest form of bioremediation, contaminated soil is excavated and spread out in layers approximately 0.3m in thickness on a lined treatment area. Bioremediation can be enhanced by periodic turning of the bed and addition of nutrients. Due to the limiting thickness of soil layers (0.3m) landfarming techniques require large areas and are not generally suitable for small sites, but can be the cheapest and most basic form of bioremediation. The excavated soil is placed into a shaped pile up to between 1.5 and 2m height and up to 6m wide in a lined area, the pile is aerated by periodical turning of the windrows by specialised machinery which can be excavator mounted or self propelled. Soil organic ammendments and nutrients can be easilly added to the windrows during turning to improve aeration and soil characteristics as required. This is often the most cost effecive method of ex-situ biological treatment. 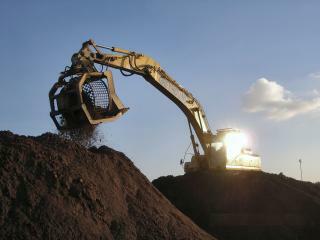 The excavated soil is placed into a shaped pile up to 3m in height and 6m wide in a lined area. The pile is aerated either via a vacuum pump or air injection blower system. Vapours from the biopile can be collected and treated onsite by granular activated carbon (GAC) or air bio-filter to reduce emissions to the atmosphere. Biopiles can be constructed taller than windrows and so require less space on site, additionally the injection of air can be used to control the bed temperature during winter periods if overwintering is required. It is also the preferred choice if particularly odourous or volatile contaminants are the issue. 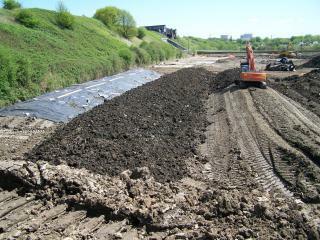 For all bioremediation techniques, an Environmental Permit is required from the Environment Agency and any run off or ‘leachate’ from the soil needs be collected and treated. Treatment times range dependent on the contamination and target concentrations from 6 to 16 weeks dependent on contaminant type, concentration and soil properties, and time of year. Ambient temperature has a significant effect on bioremediation with best degradation rates occurring during the warmer summer months; cold winter weather can significantly slow and even halt biodegradation.